← Healthy Enough to Run the Country? Alzheimer’s disease and good news? Somehow, these two terms don’t fit. In 2016 alone, Alzheimer’s and other related dementias cost America an estimated $236 billion. While that figure is staggering, the real cost to families and caregivers is immeasurable. After looking into 2016 research findings, initiatives and information on treatment and prevention, I was heartened by what I found. 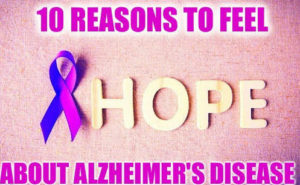 Here are 10 reasons why I am feeling more hopeful about the future of Alzheimer’s.